Bid management is one of the first things you learn in Google AdWords as it has a large impact on where your ads are eligible to appear. The process entails raising and lowering your bids to make the most out of your marketing budget. Managing bids for a small campaign with a handful of keywords generally isn’t an issue. But it starts to become extremely tedious once your ad groups grow in size. You’ll need to manually adjust your bids for each ad group and keyword. Fortunately, there’s a better alternative for those who prefer a more hands-off approach. Smart Bidding is a set of automated bidding strategies that make it easier for advertisers to automate their bids. 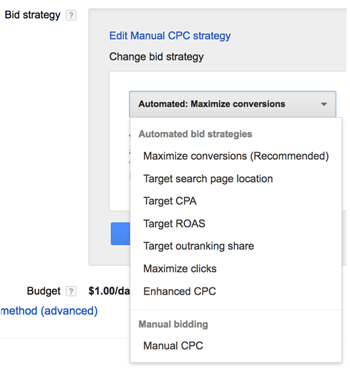 Whether you want to maximize clicks to your ads or drive more conversions, you can choose the appropriate automated bid strategy that aligns with your goals. Instead of manually adjusting your bids, simply let Google’s algorithms do all the heavy lifting while you reap the benefits. Smart Bidding certainly sounds appealing but as with any automated solution, there are also drawbacks. Here we look at common mistakes that many advertisers make when automating bids in AdWords. A common mistake that advertisers make is not fully understanding the different automated bidding strategies before enabling them. While Maximize Conversions is the recommended selection, it may not necessarily reflect the best value for your business. Maximize Conversions: This feature uses machine learning and historical information to automatically optimize your bids to get more conversions for your campaign—all while staying within your budget. Target Search Page Location: This option automatically sets your bids to increase the chance that your ads will appear at the top of the page or on the first page. Target CPA: With this option, you set a target cost-per-acquisition (CPA) and AdWords will help get as many conversions as possible at that amount. Target ROAS: Using previous conversion data, AdWords sets a maximum CPC for your bids to maximize conversion value while trying to match the average return on ad spend (ROAS) you set. Google recommends having at least 50 conversions in the last 50 days before enabling this option. Target Outranking Share: Choosing this option allows you to specify a competitor’s domain to outrank in the paid search results. AdWords will then automatically set your bids accordingly. Maximize Clicks: This option automatically sets your bids to drive as many clicks as possible to your landing pages. The AdWords bid automation strategy you select will ultimately depend on your advertising goals. It’s important to understand each of these options before choosing one. Smart Bidding works by optimizing bids based on historical data. The more data you have the better as it allows Google’s machine learning algorithms to make more accurate predictions and optimize your bids accordingly. Another common mistake that advertisers make is assuming they can enable an automated bidding strategy and watch the sales roll in. But having enough conversion data is crucial for the algorithms to build and customize performance models that align with your business goals. For conversion-based bidding strategies, Google recommends having at least 30 conversions in the last 30 days. While you can certainly enable an automated bidding strategy with less data, the initial learning period may take much longer and you are likely to see more fluctuations in your bids. If there is not enough conversion data, Google will flag those campaigns with a “Limited (not enough data)” status and show the recommended conversion threshold to deliver optimized bids. Perhaps the biggest problem with relying on automated strategies to manage your bids is they do a poor job of factoring in seasonality. By looking at sales data from previous years, you might notice that conversions spike around the summer and then start to drop off as winter approaches. Increasing your bids during those summer months would mean more clicks and sales from your campaigns. But automated bidding strategies often don’t factor in those occurrences. In fact, more recent time periods tend to be more heavily weighted than events farther in the past. That means you could be losing out on clicks and sales during those crucial periods for your business. Automation certainly sounds appealing as it means letting Google’s machine learning algorithms optimize your bids based on historical data. Once you enable an automated bidding strategy for your campaigns, simply sit back and watch as the sales roll in right? Ad positions are determined by Quality Score which is a combination of your bid and relevance. Raising your bids is often the fastest way to increase the visibility of your ads for certain keywords. The problem with automated bidding is that you relinquish that level of control. In other words, you won’t be able to selectively choose those valuable keywords to increase their bids with automated bidding. If one keyword performs exceptionally well, you can manually increase its bid and get even more value out of it almost immediately. But when you enable an automatic bidding strategy, you rely on Google to make that choice for you which may not necessarily provide the best value for your business. This isn’t to say that automated bidding strategies is completely useless. Google even highlights a case study where a luxury composite decking company saw a 73% increase in conversion volume. So it’s definitely worth testing whether automated bidding would be a good fit for your business as your campaigns could see similar results. But it’s still a good idea to keep close tabs on your campaigns and avoid some of these common mistakes. 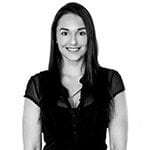 Emily Reiffer is general manager at Digital Monopoly, parent company of Paid Traffic, an Australian based PPC advertising agency. She is a marketing fanatic and entrepreneur with a passion for everything search engine related.